Nobody’s perfect, and just as people have bad hair days; so too we sometimes experience bad styling days. Sometimes the blame lays with the accessories we’ve chosen. Personal style like fashion is an art form. An expressive medium allowing us to emit all manner of information about who we are, what we hold important and where we want to place ourselves within the communities we live. Over time, through trial and error we learn what makes us look in the mirror, smile and say ‘that’s me!‘ and why the things that fell short missed the mark. Accessories are often the make or break factor especially if you have a figure that does not allow you to wear all the styles you may like to. Conversely, the rest of your outfit can make your chosen statement accessory shine or look out of place. Choosing the perfect accessory to go with an outfit comes naturally to some, while it takes others a little longer to work out what’s right for them. This week I want to explore some of the keys to finding the perfect accessory for an outfit and how to fix things when you know something is wrong but are not sure what. If something you’re wearing is making you physically uncomfortable: maybe it’s a pair of earrings that are too heavy, a tote that feels cumbersome, or a pair of stilettos that are killing your feet even before you’ve left the house – exchange them. All of these things distract us, cause us to feel a level of self-consciousness and in the case of painful shoes, can turn us into ill-tempered she-devils. In short, they affect how we carry off our look and interact with others. Fidgeting and looking uneasy is the total opposite of chic. 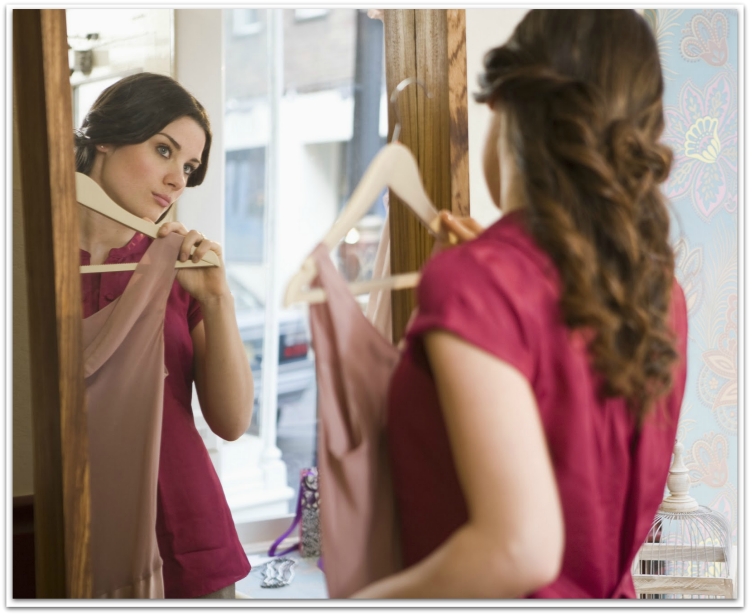 You know the situation you’re standing in front of your mirror and you like the outfit in theory but you have a niggling in your gut that there’s something not quite right? I’m not sure about the…..color, bulk, style etc. Trust that feeling and follow your style instinct, whatever it is that you’re unsure about just take it off or replace until you can look at yourself and say – I love it! Accessorizing can be a tricky business. The previous styling tip promotes trusting yourself, and in order to do that you need to take your time to get to know which accessories look good on you, match your personal style and coordinate with the outfit you’re creating. Whenever you have a little downtime, play dress up in your closet. Get intimately acquainted with all the items in your wardrobe. Seek to find as many flattering and personally satisfying outfits as possible. It may take a few months but if you do you’ll soon be pulling items together and accessorizing expertly and effortlessly. I take photos of every outfit I wear – that way I can more easily see what worked and what didn’t in terms of style, coordination, and accessories. It also provides a visual record of my outfit options and takes only 2 minutes to do each morning. Gone are the days (well, until it’s ‘in’ again) when it’s all about matching your accessories. That kind of matchy-matchy styling is considered out of sync with today’s thinking and constructing a look that appears stylish yet effortless. Pick one statement piece and aim to complement/harmonize it with your outfit, rather than matching all the items. Take inspiration from your outfit but don’t let it dictate everything—the key word here being ‘harmony’. Bridgette Raes has a very good feature on how not to be matchy-matchy. “Before you leave the house, look in the mirror and take one thing off.” These are wise words for any woman who has a tendency to wear too much color, too many accessories or too many focal points. Elegance and sophistication is underpinned by simplicity and moderation. If your bangles make a racket, your neon pink heels clash with your bright yellow necklace or you’ll drown if you fall in the river under the load of your accessories – tone it down by removing the most distracting item. Let the mirror be your friend and always edit yourself. Accessories should harmonize with the scale of your body’s frame and your outfit. If you have a small frame, be mindful not to overwhelm it oversized bags or large or chunky jewelry. Instead, opt for small to medium sized accessories. 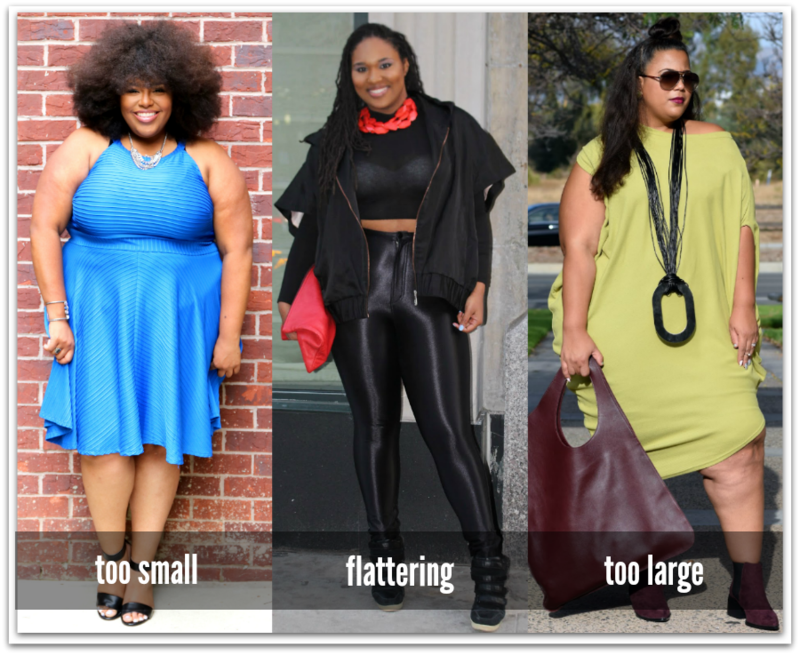 Tall gals can handle bolder, larger items if their personality also supports it, while curvy women are best with medium to medium-large sized items. Small items will exaggerate their size by comparison while large items will enhance size. Some accessories fail because of visual weight imbalances. While contrast in weight can look great it often takes expertise and experience to know how to pull it off. 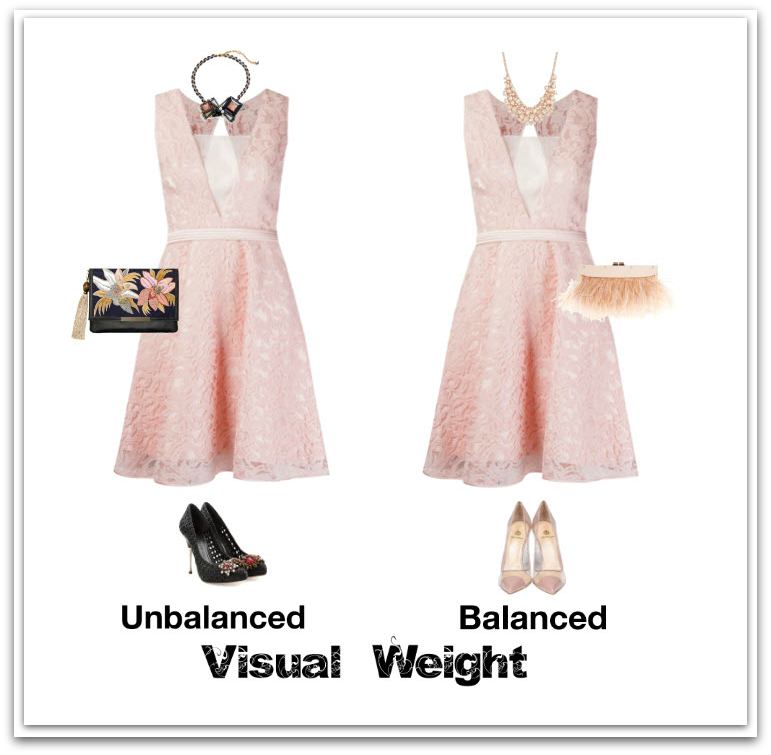 Take note of the visual or apparent weight of your main garment and add accessories that have a similar visual weight. This is apparent in the image below. While the dress is light in color so too it looks light in visual (apparent) weight and as a result, requires accessories that appear to have a similar weight. Both the heavy visual weight of the black bag and shoes and the solid nature of the embroidery throw off the visual balance of the dress while the accessories for the second are visual harmony. Another common accessory fail is a lack of unity between the styles. In the first outfit below the earrings and clutch share both color and geometric shapes and are just passable with the dress. However, they have no unity to the lace ankle boots. 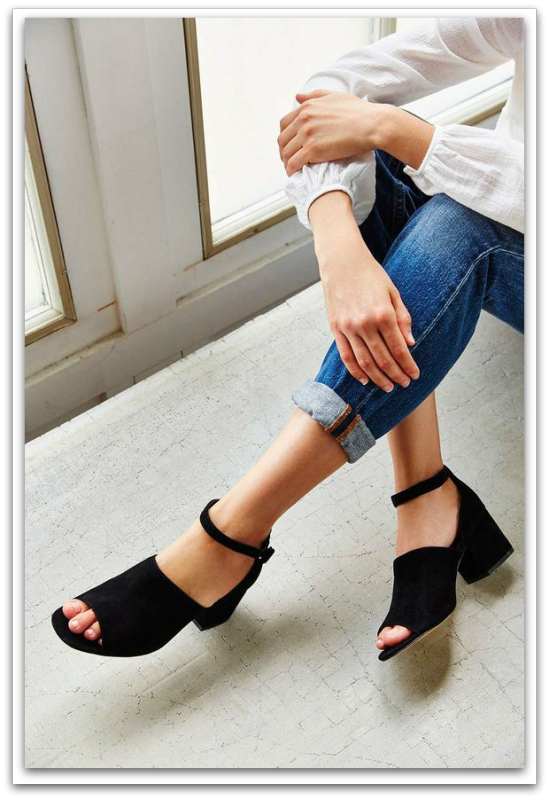 In turn, the lace boots while sharing the color black are too feminine and light-weight to work successfully with the heavy style of the dress. All the components of the second outfit share a similar theme. While DIY-ing your style is always great, nothing beats the opinion of a professional. If you feel you need assistance Image Innovators have many consultants around the work that can help you. Building a wardrobe with key clothing pieces will be the foundation of your style. Think of accessories, as the cherries on top or the decorative icing on the cake, these embellishments or outfit add-ons are what can make your style stand out and make your looks more personal and unique. This is really good.May I reblog it on my blog superiordomain.net? I’d be honored. Please be sure to add links and acknowledgement of Ann Reinten AICI CIP as the author. CC me when it’s up please. I never thought about these points consciously before. You are doing me lots of good! You are most welcome Pauline. Thank you so much, for allowing me to reblog your article.Will make sure I do it when I have enough time,so that I do it right.